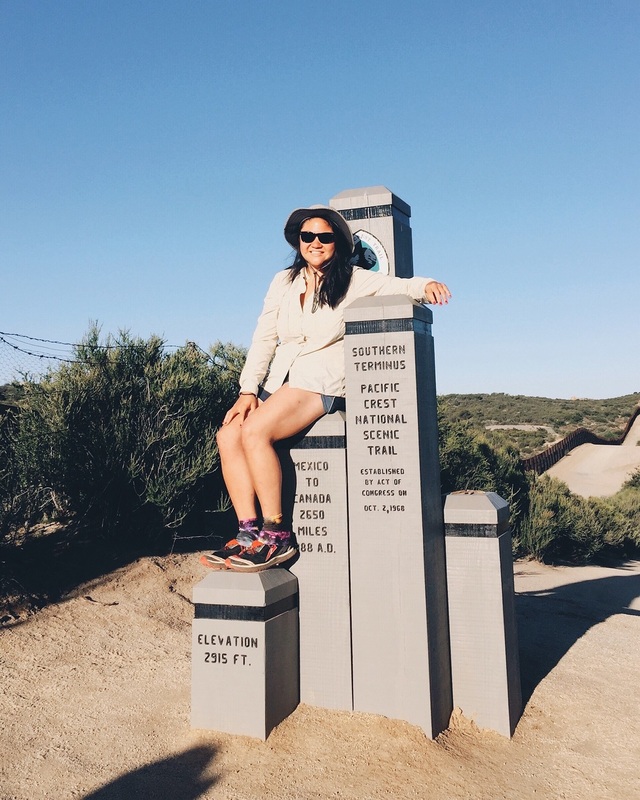 Today is April 18th, 2016 and I started hiking from the Mexico border on the Pacific Crest Trail. The morning of, we woke at 4:30am and drove to Campo, CA from Encinitas. We arrived at the Southern Terminus around 7am to see a large crowd of hikers all taking photos with the monument that have been recently dropped off by Scout and Frodo. We each took our turns with the monument and started walking. Jenny is walking the first 20 miles with me as her first thru-hike for my moral support. The air was cool at first, but the sun quickly warmed up the sky. The dusty trail rolled up and down around the corners of the hills. The huge group of hikers we saw in the beginning quickly disappeared ahead of us. After just a couple of miles, the sun became harsh so we took a small siesta under the next shade we found. I decided to use my umbrella for the first time to shade myself from the high sun. At around noon, we found another great siesta spot under a large tree and rested for awhile. At every break, we made sure to change our socks and clean/dry our feet. It really made a huge difference on preventing blisters and feet comfort. Your feet are probably the most vital part of your body when hiking, so it's really important to take the time to give them lots of TLC. The trail became more rolling hills for the rest of the day and the sun just made every step seem even harder. We were only going just a few miles but it just seemed like forever. Our most eventful part of the day was when I walked into a bee swarm. A bunch of bees got trapped under my umbrella and a bee was stuck in my hair and couldn't get it out. It was terrifying and we just had to run through that part. We think Jenny got bit on her ankle by one. The bugs here are no joke. There's always things flying around and things crawling all over the floor. 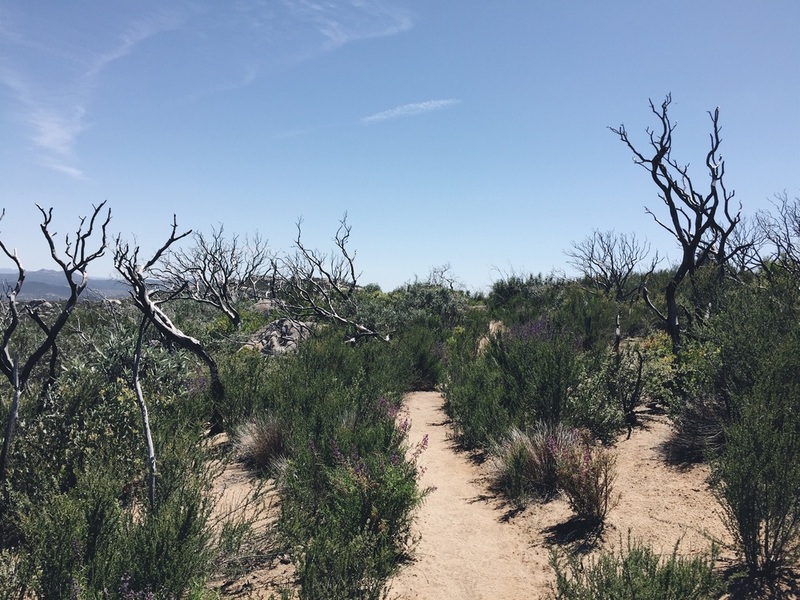 The trail winds up on top of this hill filled with dried up trees and desert flowers. Cold soaked coconut curry rice for dinner. So yummy! After mile ten, we knew we wanted to just go a little bit further but before Hauser Creek. It was around 5pm, and I was just exhausted and super sluggish. The sun completely drained my energy and we got started much later than I had hoped. We stumbled upon a little campsite and decided to call it a day. Several hikers passed us by as they were attempting to make it further that night. We questioned if we should had hiked further as well but I knew I was just too tired. I couldn't wait to eat my coconut curry rice for dinner. It was SO good. We met our first friends Mike and Jackie from New York who stopped at our site to eat their Subway dinner with us. They were super friendly and great to talk with. I noticed that the best time to actually chat with people is probably at breaks, water sources or at camp. I passed out pretty much immediately around seven and slept so warm.